The importance of networks in labor markets is well-known, and their job segregating effects in organizations taken as granted. Conventional wisdom attributes this segregation to the homophilous nature of contact networks, and leaves little role for organizational influences. But employee referrals are necessarily initiated within a firm by employee referrers subject to organizational policies. We build theory regarding the role of referrers in the segregating effects of network recruitment. Using mathematical and computational models, we investigate how empirically-documented referrer behaviors affect job segregation. We show that referrer behaviors can segregate jobs beyond the effects of homophilous network recruitment. Further, and contrary to past understandings, we show that referrer behaviors can also mitigate most if not all of the segregating effects of network recruitment. 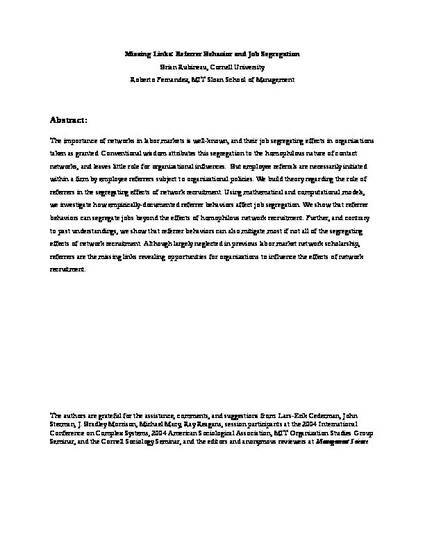 Although largely neglected in previous labor market network scholarship, referrers are the missing links revealing opportunities for organizations to influence the effects of network recruitment. Rubineau, B. & Fernandez, R. (in press). Missing links: Referrer behavior and job segregation. Management Science. © INFORMS. Reprinted with permission. All rights reserved.